Never Enough Nails: Wet n Wild Correction Tape= AWESOME! Today I have the last of the Wet n Wild On The Prowl polishes that I purchased. Wet n Wild Correction Tape is one of those multi-colored glitters in a clear base that we've been seeing more of lately, although I think this is the best one!! 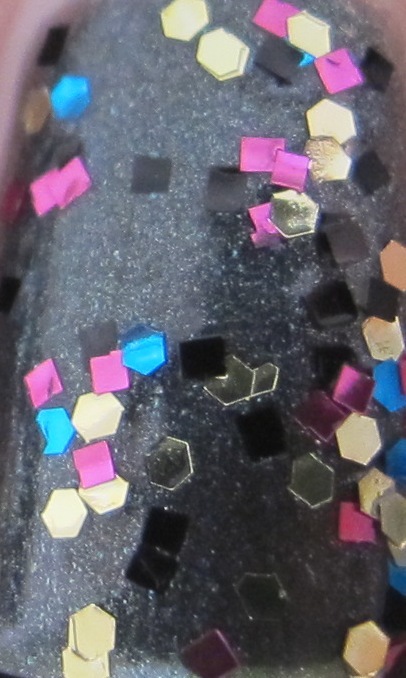 Correction Tape contains square pink glitter, blue hex glitter, gold hex glitter, silver hex glitter and most awesomely, square black glitter. 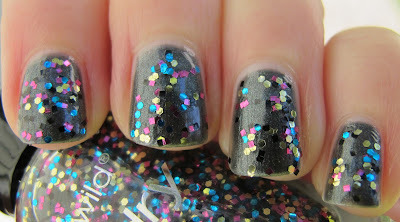 Now, Revlon Black With Envy is not the best polish to use as a base for Correction Tape if you want to showcase the black glitter. I kind of forgot the black glitter was there when I picked Black With Envy as a base. Next time I will try this over a pale base, maybe OPI Play The Peonies? Despite the base color, Wet n Wild Correction Tape is totally awesome. 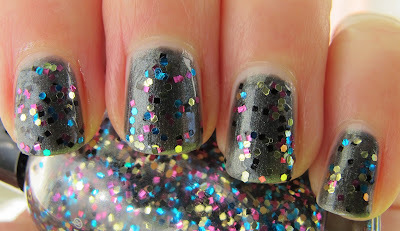 It is 100 times cooler than Wet n Wild Party of Five Glitters. I only wish I had purchased two of these because I can see myself wearing this ALL the time over EVERYTHING. Wet n Wild On The Prowl has been very hard to find. It's popping into Ulta stores, so check there. There are also some polishes from the collection on Ebay. The prices are slightly elevated, but not awful. I really like this, it's fall appropriate, rocky AND glittery.. love it. So nice, i love glitter top coats, really jazz up old nail varnishes! That is a great combination!! Love it! Such a great combo! Lackynails- thanks, I was loving it too! It does look great for fall. AngieBeautyBelle- so true! Glitter top coats make me wear polishes I haven't worn in ages! April- thanks! Do you own Correction Tape? Peace, Love and Polish- thanks! Do you have either of these pretty polishes? looks awesome! I just found this yesterday finally. can't wait to try it out.